I was discussing with a friend what it takes to get published in the very top journals. The established answers include: need excellent data (eg. multiple sources and time points), a novel and interesting idea, and well written work. To explore this, I did a very rough examination of articles published in four, 4* journals, as indexed by ABS. ; these are: Journal of Applied Psychology; Academy of Management Journal, Organizational Behavior and Journal of Management; from 2009 to July 2018. This yielded 2814 documents, and a total of 4557 authors. 38 authors have published 10 or more articles. 87 authors have published between 7 and 9 articles. 169 authors have published 5 or 6 articles. 3761 authors have been associated with 1 or 2 articles. At first blush, it seems there are two groups, of which the second is a very select group. 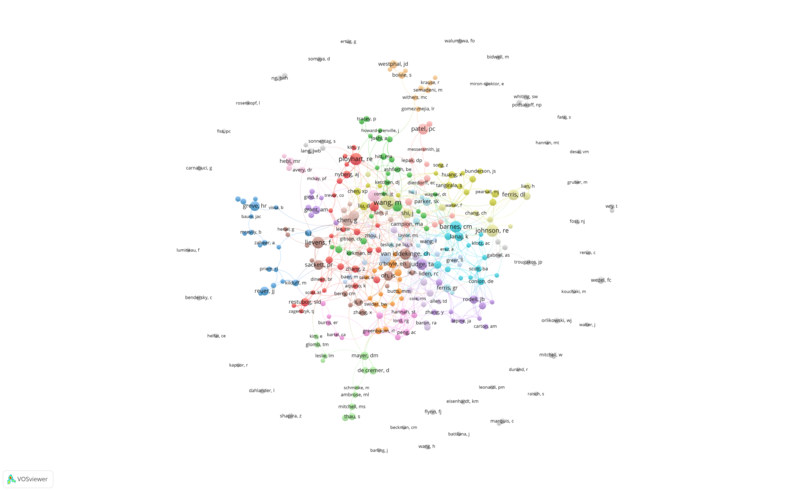 I then conducted a co-citation analysis, which examined how often authors collaborate on the 2814 articles, and drew some resulting networks. 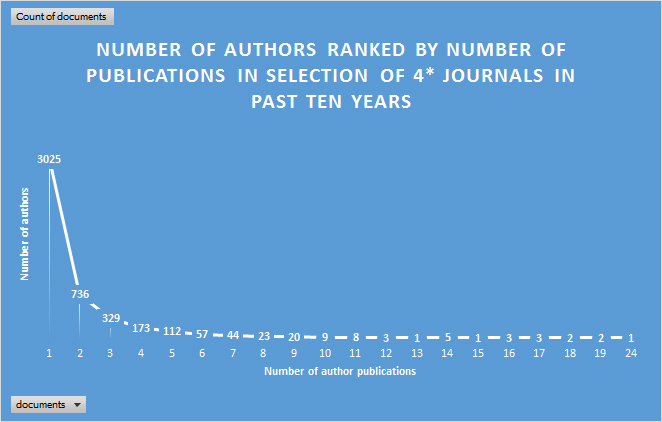 For simplicity, the first graph shows the authors who have published 8 or more articles in the past decade. I would say that anyone who has produced that many in a decade deserves to be coined “super-stars”, so this is the co-authorship maps of how superstars work together. It seems there are three types, one are the independents, producing on their own (or their own team, but more on this in the next graph); a second group are superstars who consistently produce together; and then, the third group that is interconnected, many of whom are bridges between groups, and produce with a range of other, high performing superstars. It is this last group that dominates the map. These results are very much in line with network theory on successful teams, as I have discussed in anther post, referring to a TED talk by Brian Uzzi; where they show that successful teams have someone borrowed, someone new, someone old and someone… umm.. blue. This map also shows the periphery where we find the teams of researchers with one publication, the ones I termed “lucky”. Please note, I do not dismiss the enormous amount of work these “lucky” ones have put down in their publication. It is only meant as a provocative term to consider what distinguishes those who have “only” one publication at this level, from those who have multiple. 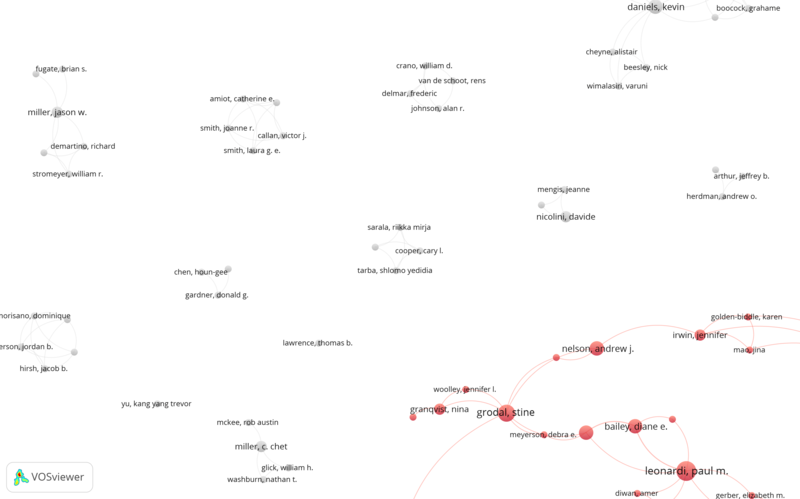 In the following figure, you see several such teams, each of the clusters have one publication between them. When trying to find the key to get into these publications; rather than looking at a random sample of articles in the publication (such as all on a favorite topic) analyze the way the superstar researchers position and phrase their questions and investigations. I would suggest you search for researchers you know, and know of, and zoom in to examine their placement. 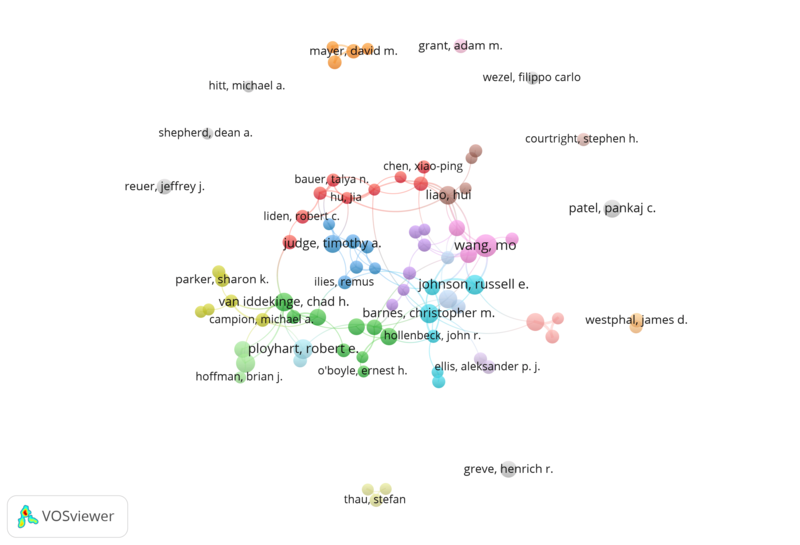 Also, find some superstars you like, and see what their co-author networks look like. There are issues with the data: 1) the choice of journals are somewhat random, apart from their status. Second, some authors have their contributions separated on two entities, for example: Maureen Ambrose is listed as publishing 7 articles, while Maureen L. Ambrose has 1. These two should have been combined. A very preliminary and rough estimate indicate that about 4% of the names have this issue.